On April 20, there was a piece of good news for residents of Delhi from the sky, literally. A satellite image released by the American space agency, NASA, showed that incidents of crop residue burning in Delhi’s neighbouring states of Punjab and Haryana had significantly reduced compared to last year. But the joy was short-lived as subsequent images showed a spike in crop residue burning from the two states. A year ago, when the Delhi government implemented the second edition of the odd-even vehicle restriction during April 15-30 to fight air pollution, the Central Pollution Control Board, to everyone’s surprise, found that the pollution levels had increased during the experiment. This put a question mark on the efficacy of the emergency measure. Clean air campaigners and members of the Environment Pollution (Prevention & Control) Authority (EPCA), a body appointed on the Supreme Court’s directive to oversee environmental issues in the National Capital Region, went through volumes of data to understand this paradox. That answer came from an image sent by a NASA satellite. The image showed that the smoke from crop residue burning in Punjab and Haryana had travelled to the national capital, causing the rise in air pollution. “But farmers don’t burn the rabi wheat crop residue, because it is an important fodder. 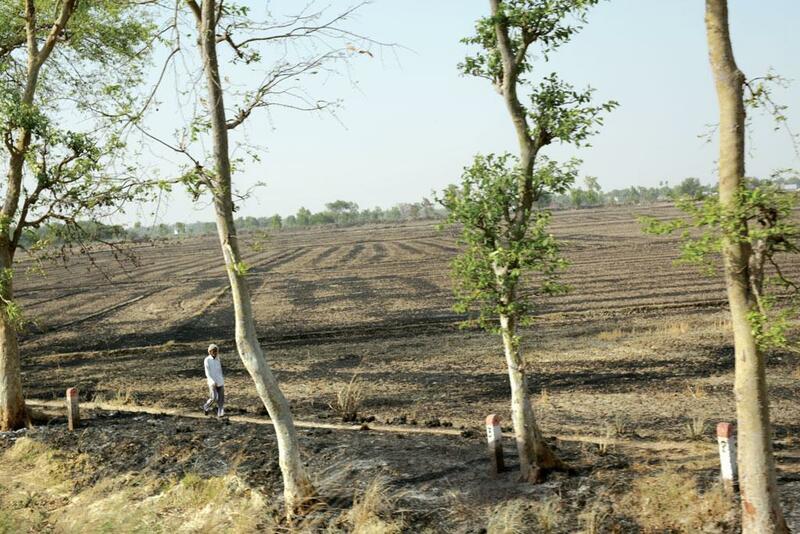 We knew then that there was widespread burning post-paddy harvest—from October end till mid-November each year. This was happening because farmers in Punjab and Haryana were caught in a vicious time-cycle—they had to harvest rice and cultivate wheat in a space of 10-15 days. Rice straw was not a useful fodder, but we did not know about the burning of wheat residue,” explains Bhure Lal, former bureaucrat and now chairperson of EPCA. What then is happening? Why are farmers burning valuable fodder? Is this only about Punjab and Haryana? No. Researchers at Delhi-based non-profit Centre for Science and Environment (CSE) point at a shocking, stark and unseen reality: “Central India, parts of north and north-east India and even countries in Southeast Asia are densely dotted in red in the NASA image. Each mark is a sign of biomass burning—crop, forest or whatever. It is almost as if all of India and parts of Southeast Asia are on fire,” says Anumita Roychowdhury of CSE. The image paints a complicated picture. The dots—hundreds of them concentrated in Madhya Pradesh, Chhattisgarh, Odisha, Jharkhand, Punjab, Haryana, Uttar Pradesh, Rajasthan and a few pockets in southern India represent biomass burning. What is happening? But more than providing answers, the image has raised questions. As explained, traditionally, November-December—the post-harvest period of the monsoon crop of paddy—is the time when farmers burn crop residue. Close to 80 per cent of the entire crop residue burning takes place in these months. This mostly happens in Punjab and Haryana, and the practice is under extreme scrutiny due to its impact on the air in Delhi. The pattern, however, is changing. 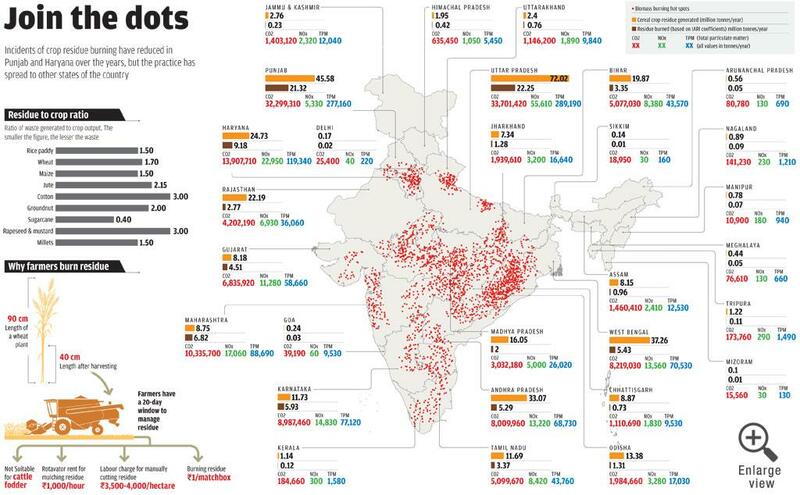 Though there is no official data, trends show that India has a new season of crop residue burning: April-May. And the crop involved is wheat, which earlier was not the case. What’s worse, the practice has spread to other states. But why? There is no shortage of time because after harvesting wheat, farmers have a two-month gap before they cultivate the monsoon crops. Extracting stubble also makes financial sense because it can be used as fodder. In India, which faces a fodder shortage of 22 per cent and where wheat crop residue is the preferred fodder, there shouldn’t be a need to burn crop residue. So, are there other factors? Joining these dots is critical because on it depends our right to clean air and the source of livelihood of the majority of Indians—agriculture. To seek answers to these questions, Down To Earth sent four correspondents to Uttar Pradesh, Madhya Pradesh, Rajasthan, and Punjab and Haryana, while three others researched on issues related to crop residue burning. The findings throw new light on the state of farming and mechanisms to control air pollution in the country. Crop residue burning in farms is not new to India. According to a 2014 study by the Indian Agricultural Research Institute (IARI), in 2008-09 the country generated 620 million tonnes of crop residue, of which close to 16 per cent was burnt on farms. Of this, 60 per cent was paddy straw, while wheat accounted for just 22 per cent. Going by estimates, Punjab alone produces 19-20 million tonnes of paddy straw and about 20 million tonnes of wheat straw. About 85-90 per cent of this paddy straw is burnt in the field, and, as the satellite images show, wheat straw is also increasingly being burnt in recent years. Of late, courts and governments have issued stern regulations and guidelines on burning crop residues. On December 10, 2015, the National Green Tribunal (NGT) banned crop residue burning in states of Rajasthan, Uttar Pradesh, Haryana and Punjab. Parts of these states constitute the National Capital Territory. In 2014, the Union government released the National Policy for Management of Crop Residue, which NGT directed the states to implement. Under this policy each state needs to have an action plan to stop residue burning by involving people at different levels—from communities to panchayats to state governments. It also calls for a mechanism to alert to cases of crop burning. Moreover, crop residue burning is punishable under the Air (Prevention and Control of Pollution) Act, 1981. Then why is the practice still gaining parlance? Ankit Choyal Jat, a commerce graduate and a farmer unmindful of the NASA satellites sensing biomass burning in his village Abgaon in Madhya Pradesh’s Harda district, offers an answer. “If I can clear my farm using a one-rupee matchbox, why will I spend thousands?” he asks. He has to prepare his farm for soybean crop in June and has to clear the stubble. According to him, the village had some 400 labourers a decade ago who would do this job. But all of them have migrated for better options. “Labour costs are very high now,” he laments. Hari Ram Karore, a 71-year-old farmer who owns more than 10 hectares (ha) in the same village, says, “We started using combine harvester machines to tide over the labour scarcity. The machine finishes the task of reaping, threshing and winnowing in a few hours and is also economical,” he adds. The machine appears to be the key reason behind the problem because it only reaps the grains, leaving stalks or stubble of around 40 cm. Those who want fodder have to get the stubble removed manually or use specialised machines to do the job. But that is costly. For every 0.4 ha of wheat crop, the cost of renting a combine harvester is just Rs 800. Once the machine has harvested, the cost of getting the stubble removed is Rs 3,500/ha. So the value of fodder is discounted because it is more economic for the farmers to just burn and clear the fields. As one travels across Madhya Pradesh, it becomes clear how widespread the problem is. There are many reports of uncontrolled fires and unintended loss of standing crops due to crop residue burning. Such is the situation that the district collector of Harda has imposed Section 144 of IPC to prohibit the practice. But like Ankit, there are thousands of farmers in Harda and other districts who don’t want to adhere to the order. It is clear that wheat crop residue burning is emerging as a major issue in districts where irrigation is not a concern, cropping patterns are intense and mechanised farming options aplenty. Eighty per cent of Harda district, for instance, is irrigated and farmers cultivate three crops a year. This means the time between crops is too short to clear residues manually and the labour is in short supply. Though there is no consolidated data on the state-wide numbers, it is clear that districts like Harda are flooded with combine harvester machines. “There are more than 250 combine harvesters in Harda,” says Kedar Sirohi of Aam Kisan Union, a farmer organisation based in Harda. “The number has shot up in the past five years because of labour scarcity. Earlier most combine harvesters in the district were called in from Punjab and Haryana,” he adds. With irrigation network expanding across the state, the acre-age has also increased. This means a proportionate increase in incidents of residue burning. The practice is also common in crop-intensive districts like Hoshangabad, Sehore and Vidisha. 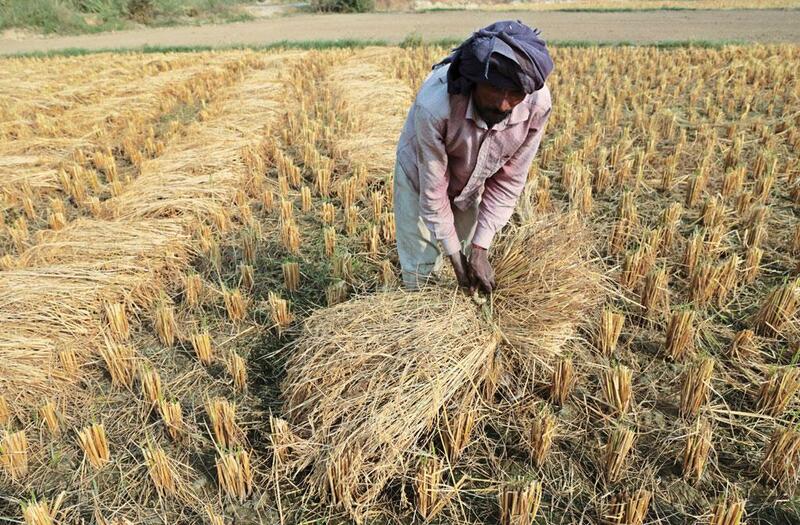 Overall, Madhya Pradesh accounts for close to 15 per cent of the country’s total 29.7 million ha of wheat crop. Estimates show that the state generates close to 33 million tonnes of crop residue every year, of which 80 per cent is from cereal crops like wheat and paddy. Of the total residue, 3.86 million tonnes is burnt on farms. In 2014, Bhopal-based environmental activist Subhash C Pandey filed a petition in the Bhopal bench of NGT, demanding a proper mechanism to ban crop residue burning. NGT ordered the Madhya Pradesh Pollution Control Board (MPPCB) to carry out a study to assess the impact of the practice on the local ecosystem. MPPCB undertook a rapid pilot study and, strangely, didn’t find any significant impact on local ecosystem. “The rapid pilot study of burning of agricultural residues reveals that no significant effect was observed on local ambient environment,” says Reeta Kori, chief scientist, MPPCB. The government, therefore, did not have to take any action. However, N P Shukla, member of expert appraisal committee of the Ministry of Environment, Forest and Climate Change, and former chairperson of MPPCB, claims that only a few preliminary studies on ambient air quality were done. Recent studies show that both particulate matter (PM) 2.5 and PM 10 were higher than the prescribed limits. There are two complimentary factors behind the increase in crop residue burning in April-May—the spread of the wheat crop and mechanised farming, explains Arun Sharma, professor of agronomy, Agriculture University, Kota, Rajasthan. This means that mono-cropping of a cash crop is the main reason behind the rise in crop residue burning in Rajasthan. This was not the case in any state even two decades ago. The popularity of wheat crop in India’s desert state becomes evident as one travels to Kota from Delhi via the Kota-Ajmer highway. There is an unmistakable layer of haze that lingers over charred farmlands along the highway as you approach the city. While burning of rice stock and stubble has been a common practice after the harvest of the kharif crop, burning of wheat stubble and biomass has become popular in recent years. “Mechanised farming and areas under wheat have increased, so crop burning has become more visible in the region,” says Sharma. The average area under wheat production between 2002 and 2006 was 313,269 ha, which is close to just half of the area under wheat production in 2014 and about 40 per cent lower than the cropping area under wheat in 2015. Close to Kota, in Arjunpura village too, farmers have started burning wheat stubble to ready their land for sowing before the monsoon. “The problem with the leftover (straw, stubble and waste) is that it floats on the water after the monsoon and doesn’t allow paddy to germinate. Still, not everyone can burn the stubble since it is difficult to manage the flames. Only farmers with big tracts of land or those who have fields in the middle of other fields that also need to be cleared can do it,” says Rakesh Prajapati who farms on 2 hectares in Arjunpura. Residents of villages around Kota say that mechanisation has killed the practice of using wheat stalk and straw as fodder, and burning is the only way out. “The cuttings left by the machines are too sharp. Not only do they injure us, even animals find it difficult to graze on,” says Shital Devi, a farmer from Chandresal village in Kota district. “In any case, there is barely any fodder in these cuttings,” adds another resident of the village, Gurucharan Singh. Though satellite images show that stubble burning is prevalent in Uttar Pradesh, the Uttar Pradesh State Pollution Control Board (UPPCB) says the practice is negligible. This year, only one complaint was lodged in the state around the third week of April in Gautam Budh Nagar district. DTE also travelled to Gorakhpur, which was one of the places highlighted in the NASA image and is the home constituency of the Chief Minister, Yogi Adityanath, only to find that UPPCB does not monitor the impact of residue burning on air quality. T N Singh, assistant scientific officer, UPPCB, Gorakhpur, says that they have a total staff of 15 in the three stations in the city. These stations work one day a month to check pollution levels. When asked about any possible difference in the air quality in the past three months, he said that they are yet to process the April data. Singh also told that there is a fine of Rs 5,000 on burning crop residue and admitted that there are reports of residue burning in Gorakhpur and in the neighbouring districts like Deoria and Maharajganj. Interaction with farmers in Gorakhpur brought to light a completely new aspect—fodder scarcity is causing agrarian conflicts, which lead to stubble burning. How this unfolds is bizarre. After harvesting, the remains in the field need to be processed to be used as fodder. For this farmers call threshing machines. The farmers expect the machine to clear the field and provide them the fodder extracted, for which they are willing to pay. Owners of the threshing machine, on the other hand, say that the fodder extracted is never enough to satisfy everyone’s need. To hamper the business, farmers burn the little 10 cm stubble in their field that has remained even after threshing and ensure that the fire spreads to adjacent fields. Motilal Yadav, resident of Simra village in Gorakhpur, explains, “I had only harvested wheat and had a 40 cm stubble in my farm which could have been used as fodder. But a fire in an adjacent field burnt the residue in my land and eventually spread to 80 ha.” It even reached the neighbouring Shioria village, where fire brigade had to be called. Balwant Yadav from Shioria village claims that he knows the name of the person who started the fire, but naming the person can get him in trouble. There is another theory behind these fires. Farmers allege that during threshing, there are sparks from the threshing machine which triggers fire. “This could be true,” says Neeraj Yadav, resident of Ghunghun Kotha village in Gorakhpur and owner of a threshing machine. It is clear that what ails Punjab and Haryana has spread to Madhya Pradesh, Rajasthan and Uttar Pradesh. And it is a vicious cycle. First, to increase agricultural yield irrigation is boosted. Once that is done farmers adopt multi-cropping patterns to maximise profits, leaving little time between crops. And to sustain this new pattern, machines are used to compensate for the labour shortage. In Punjab, there is a window of just 15-20 days between two crops, while in agriculture-intensive districts of Madhya Pradesh, the window is around 30 days. The quickest and cheapest solution is to burn the crop residue. According to the State of Indian Agriculture 2012-13, there were 3.15 million tractors and 477,000 combine harvesters in the country till 2012-13. India is the largest manufacturer of tractors, with a density of about 16 tractors per 1,000 ha. The world average is 19 and the figure for the US is 27. The share of agriculture labourers in India has reduced to 5 per cent in 2012-13 from 15.4 per cent in 1971-72. The use of draught animals has also reduced from 45.1 to 5.1 per cent in the same period, while the use of tractors increased from 6.8 per cent to 45.8. As the new season of crop burning gets under way, it does raise the inevitable question: what will be its impact on the air quality and people’s health? The IARI study estimates that in 2008-09, crop residue burning released 149.24 million tonnes of carbon dioxide (CO2), over 9 million tonnes of carbon monoxide (CO), 0.25 million tonnes of oxides of sulphur (SOX), 1.28 million tonnes of particulate matter and 0.07 million tonnes of black carbon. Our analysis shows that PM emissions from crop burning in one year is more than 17 times the total annual particulate pollution in Delhi from all sources—vehicles, industries, garbage burning, etc. Similarly, the total national annual emission for CO2 from crop residue burning is more than 64 times the total annual CO2 pollution emission in Delhi. For SO2, the total national annual emission from crop residue burning is about five times the total annual SO2 pollution emission in Delhi. This can lead to a number of health problems. 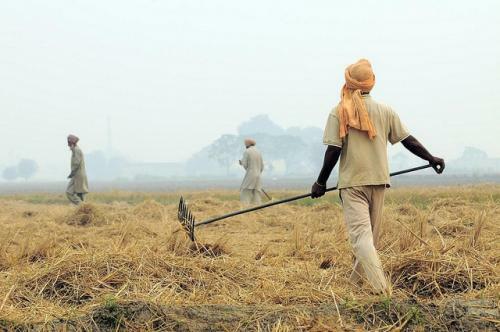 A study by the Institute for Social and Economic Change, Bengaluru, has estimated that people in rural Punjab spend Rs 7.6 crore every year on treatment for ailments caused by stubble burning. Moreover, climate scientists have already linked fine particulate matter in the haze to the melting of Himalayan glaciers. One year of crop residue in Punjab contains about 6 million tonnes of carbon that on burning could produce about 22 million tonnes of CO2 in just 15–20 days, says a 2014 study published in SpringerBriefs in Environmental Science. The study also shows that CO levels become critical in the area surrounding a burning field: concentrations of 114.5 mg/m3 or more were observed at 30 m from burning fields and 20.6 mg/m3 at residences 150 m away. The permissible limit of CO in ambient air is 4.0 mg/m3. Significant amounts (40–50 µg/m3) of nitrogen oxide (NO2) and ammonia (NH3) were also recorded during burning in the study, which also said that a ban on burning of crop stubble in the UK resulted in a significant decline in the emission of ammonia. Apart from humans and animals, residue burning also adversely impacts the soil health. Burning one tonne of rice straw accounts for a loss of 5.5 kg of nitrogen, 2.3 kg of phosphorous, 25 kg of potassium and 1.2 kg of sulphur in the soil. According to a presentation made by G V Ramanjeneyulu, agriculture scientist and executive director of Hyderabad-based non-proft Centre for Sustainable Agriculture, before the Punjab government, heat from burning straw penetrates 1 cm into the soil, elevating the temperature to as high as 33.8-42.2 ° C. This kills the bacterial and fungal populations critical for a fertile soil. The presentation also said that the monetary cost of burning to Punjab farmers is around Rs 800-2,000 crore every year in terms of nutritional loss and Rs 500-1,500 crore in the form of government subsidies on nitrogen, phosphorus and potash fertilisers. What then are the options open to farmers? One, they can till the stubble and straw back into the ground using a variety of machines; two, they can get the straw baled and transported to power plants, where using biomass electricity is generated. But both alternatives are falling short. And now there is much more straw to burn. The rapid pilot study in Madhya Pradesh that looked into crop residue burning recommends the use of rotavators—machines that mulch the crop residue into the soil. The machine costs around Rs 1.50 lakh. Jagdeesh Prasad Chaudhary, a farmer in Harda, also suggests using it. “But rotavator is not easily available and renting it costs Rs 1,000 per hour,” he says. What’s worse, some farmers don’t find it feasible. “A more innovative approach would be to use the same combine harvesters but with a stubble distributor at the end. This one would distribute the stubble in a fine layer over the field,” says Joseph Mpagalile, Agricultural Engineer, Plant Production and Protection Division, Food and Agriculture Organization. 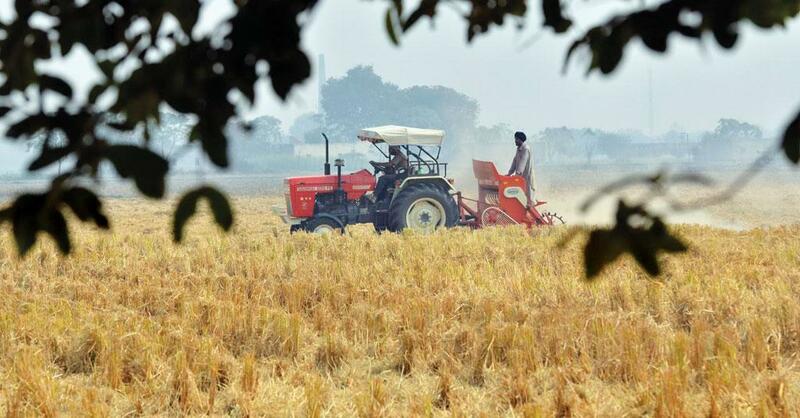 In another significant development this year, the Punjab government directed manufacturers to install a straw management system in combined harvester machines. The straw management system cuts and mulches the leftover crop into the same field. However, the manufacturers are considering going to NGT because the order, they say, would make their products expensive and unsellable. There is another machine that helps farmers do away with burning—Lemken hal, a plough that goes deeper than a traditional plough and brings up the stubble to bury it in the field. “It goes about 30 cm into the soil, but costs around Rs 2 lakh after a Rs 40,000 subsidy. If the government increases the subsidy, we can buy it,” says Amarjeet, a farmer in Bhogpur village of Jalandhar district, Punjab. “But this won’t work in areas where the soil below is infertile,” says Gagandeep Singh of Bhotna village in the same disrict. “The plough digs so deep that it is impossible to level the land using a tractor,” he adds. A K Ghosh, Director of Kolkata-based Centre for Environment and Development, says the problem is that the government has not been able to incentivise technological alternatives to crop residue burning. He refers to Happy Seeder—a machine developed by the Punjab government in collaboration with CSIRO, the Australian government’s scientific research agency. Happy Seeder allows planting of wheat through the residue. “It may be expensive for small and medium farmers, but large farmers can easily afford it. The government can subsidise it,” he says. In the NGT directive of 2015, the five states that share the NCR air shed are supposed to “provide machines, mechanism and equipment like Happy Seeder or its cost to the farmers to ensure that agricultural residue in the field in these states are removed, collected and stored at appropriate identified sites in each district”. It also suggested that a mechanism be set to provide free equipment to farmers having two acres or less land (one acre equals 0.4 hectare) to help them reuse the stubble. Farmers, like Sukhdeep Singh of Jaimal Singhwala village of Barnala district, Punjab, say the government has not kept its promise to provide alternatives to crop burning. “In March, the agriculture department said that they would provide 50 per cent subsidy on dhaincha (Sesbania aculeata)—a fodder crop. I cultivated it on my entire 7 ha farm last month, but they still haven’t given the subsidy,” says Sukhdeep. Dhaincha is a green manure plant sown on an uncleared field. When the plant matures in two-three months, it is ploughed over, and mixed in the soil. The process not only takes care of the last crop’s residue (which has decayed by now), but also adds nitrogen to the soil. Traditionally, crop residues had many uses—from thatching to making bed for livestock. “But the new world has alternatives for all these uses. So, the first step to curb crop burning is to find uses for the stubble,” says Roychowdhury of CSE. In recent time, there have been attempts to create uses for stubble to make it economically lucrative. Producing power from this biomass is an option that has received attention. There is a plant near Ghanaur village in Patiala district that uses rice straw to produce power. The company that runs this power plant gives farmers machines to remove the stubble and ensures that they are timely collected from fields. The plant generates 12 MW of power using 120,000 tonnes of stubble collected from close 15,000 farmers. But Punjab is a power surplus state and the number of such plants is few. Though no exact numbers are available, a government estimate says that the state uses just 0.94 million tonnes of stubble from farmers for biogas purpose. Haryana has no such plant in operation. This is despite the fact that the Central Electricity Regulatory Commission allows preferential tariff to biomass-based power plants. In Punjab the government gives Rs 8.17 per unit for electricity from biogas plants, which is higher than the rates for power produced from solar and wind sources. Similarly, projects for pelletisation, or using paddy straw as sub-strata for mushroom cultivation have been limited to a few farms or a few districts in Punjab. They are yet to achieve the kind of scale at which they will consume the available crop residue. However, the single largest obstacle continues to be the lack of a decentralised procurement and collection mechanism to mobilise the crop residue from the fields to aggregation centres. The crop residue that remains in the field requires to be monetised to be extracted. For its usage in any alternative way, the crop residue must first be extracted from the field, baled and readied for transport. In the current scenario, the farmer in Punjab has no incentive to spend the resources required to extract the crop residue from the ground. India is not the only country struggling with the problem. In Africa, there is hardly any country with a national policy to curb crop residue burning. Across the world, governments are framing policies to curb the menace, particularly in developing countries. In 1999, the Association of Southeast Asian Nations started a “zero burning” initiative, but no country was enthusiastic to roll out the plan. Among the developed countries, the United Kingdom enacted the Crop Residues (Burning) Regulations Act in 1993 that prohibits people from burning residue, except for purpose of education or research or to eliminate pests. China, however, devised an interesting way to deal with the problem. It banned stubble burning in 1999 and penalises officials under whose jurisdictional area the burning is detected. The fines go up to $80,000. In 2015 in Henan county government collected $ 37 million in such penalties. The problem of crop residue burning was also highlighted by the Food and Agriculture Organization in 2007, which said that lack of funds, more than anything else, had resulted in poor implementation of programmes. “What is threatening is the fact that pollution doesn’t recognise political boundary. Pollution from this large-scale residue burning ultimately affects the larger air shed, impacting all of us, irrespective of whether we are in Delhi or Harda,” concludes Roychowdhury. While FARMERS resort to crop residue burning in India to clear their fields, in Southeast Asia, the practice is followed for the cultivation of palm oil, paper and pulp plantations. This slash-and-burn agrarian method is seasonal and prevalent in Indonesia, Sumatra, Myanmar and Vietnam. It causes the infamous haze in Southeast Asia, which reached alarming levels in 2015. The problem is not just limited to the countries carrying out the burning. The smoke spreads to neighbouring countries like Malaysia, Singapore, Thailand and the Philippines. The air pollution caused by the activity is immense. When the burning was at its peak in October 2015, the Pollutants Standards Index (PSI) readings of Sumatra were more than 2,000. A PSI reading of 300 and above is considered hazardous. According to a study published in Nature, the total amount of carbon released as a result of the fires in September-October 2015 was about 0.23 million tonnes. Of this, 83 per cent was in the form of carbon dioxide (0.7 million tonnes), 16 per cent carbon monoxide (0.9 million tonnes), and 1 per cent methane (3,200 tonnes). The figures for total annual carbon and carbon dioxide emissions were estimated to be 0.3 million tonnes and 0.9 million tonnes respectively. Indonesia, south-eastern provinces of Sumatra, and Papua accounted for 97 per cent of this emission. In India, burning is a common occurrence. There is a cultural acceptance for everything that is burnt. Soil biology is not discussed much. When it comes to wheat residue burning in Punjab, there is a problem with manual labour. Migrant workers have stopped visiting the state. There is a mismatch between manual labour required and its availability. Though wheat straw is suitable for animals, it is problematic to store huge volumes of straw in one part of the land. It is also difficult to transport it back to villages, as additional cost is incurred. Fodder storage problem is the main cause behind farmers burning wheat residue. At the village level, there is also the problem of selling the husk due to the absence of a proper rate for fodder. Absence of market linkages is responsible for this. Attitudinal problem and the lack of law enforcement are also to be blamed. There is shortage of manual labour, as most migrant workers leave in October-November and come back in May-June. Wheat stubble burning is a relatively new issue which started with the use of mechanised harvesting using combine harvesters. It will be good to have a mechanism in place to give carbon credits (incentives) to farmers, who are not burning stubble and recycling it back to the soil. Besides India, wheat stubble burning is an issue in China as well. This is primarily happening in rice-wheat system areas where farmers have to go for transplanting of rice manually after wheat. Small stubbles, if not managed properly, create obstacles to labourers in transplanting. Sometimes, stubbles accumulate in one area of the field and damage newly planted rice seedlings. If farmers go in for a green manure crop or a summer legume just after harvesting wheat, this can help in managing wheat stubbles. Burning of wheat stubble has been going on for decades. Earlier, bulk of the harvesting was done manually and then the stubble used to be pulled out or ploughed back into the field. With the increase in mechanised harvesting, longer stalks are left back. These require a longer time to decompose once ploughed back into the land. So, farmers tend to burn the crop residue and then plough the land. Labour shortage and growing additional crops of paddy (or sometimes vegetables) are also reasons why farmers tend to burn crop residues. There is a chronic shortage of labour in Punjab and Haryana and the wage rate is very high these days. In addition to stubble burning, sugarcane residue burning is fast catching up in Maharashtra. Both rice and wheat stubble are burnt by farmers. Usually, stubble takes time to decompose if ploughed back into the soil (around a month) and farmers think that the decomposition process attracts rats and rodents. This kind of behavioural pattern on part of farmers is a big issue. However, results show that crop productivity is not hampered if the stubble decomposes. Even if wheat stubble can be used as biofuel, the collection cost is very high. It also takes human labour for transportation. Incorporation is the best method and the stubble should go back to the soil. Stubble is organic matter and it improves the soil value. The main problem behind crop burning is the rotational cropping system of rice and wheat. Farmers burn stubble as they have to quickly clear the fields for the next crop. Also, cost of fodder is too high or of converting the stubble into something else. India is the third largest wheat producer and there is pressure on farmers to grow more and more crops. Also, we are not tracking soil health. Biomass burning is a huge thing in Africa also. The slash and burn agriculture is done on a sustainable scale as it is not a yearly thing. Please see our latest published article which discusses on black carbon emissions affected due to biomass burning activity over Indian region. Figure 7 of this article indicates month-wise specific regions over India where season-specific burning activity happens, like biomass burning. Well-written article with compelling arguments. But correct the figures you have quoted because the errors reduce this article's credibility. Jain et al 2014 reports that of the ~16% crop residue burnt on farm, 40% was paddy straw. Not 60% as you have published here. Check Jain's abstract from where, I believe, you have taken the figures. Also you write that "In India, which faces a fodder shortage of 22 per cent and where wheat crop residue is the preferred fodder, there shouldn’t be a need to burn crop residue." Who says 22%? In fact, your 23 March 2017 report "How is fodder crisis rendering livestock vulnerable?" says "Currently, India faces green fodder shortage of 63.5 per cent." People, especially students, refer to your articles and quote you. Please be a bit responsible.